Stik, the renowned international street artist, was not impressed by the likes of Rembrandt, Rubens and Gainsborough because, until recently, he had not heard of them. His subject matter, like theirs, is of individual people or groups of people, with the occasional dog, but after that, there is little similarity, unless you look very carefully. So when, about four years ago, I introduced Stik to the permanent collection at Dulwich Picture Gallery he was immediately drawn to the pictures of people, more specifically, complete people interacting with each other; he did not see Gainsboroughs, Rubens, Franceschinis or Murillos, or even Adam and Eve, he saw a deep friendship between two sisters, a horrified man rejecting a sad woman, an adult helping a child. It is these human aspects of the old master paintings that he has reinterpreted on walls around Dulwich Picture Gallery, and amazingly, without the help of costume or background, tone or colour, their 300-year-old source is instantly recognisable to anyone who is fairly familiar with the collection. In fact perhaps you might learn a little more about the original inspiration than when, impressed by the name of the artist, you marvel at the brush strokes, the perspective and the nuanced chiaroscuro, but miss the essence. Stik's figures are stripped down to the core of a human being. He does not confuse the message with clothes, hair or any props which could imply status or wealth; his people are not individuals who may be beautiful or ugly, old or young, black or white, they are generalised figures packed with feelings that everyone can recognise. His is a universal language that transcends period, gender, education and age. Everyone can identify with his figures because they are all about human feelings and emotions - love, anger, joy, fear, jealousy, pride, friendship and very often, vulnerability, which we have all experienced. It is not easily done. His simple lines create a very subtle body language. And for facial expression there are only eyes. Mouths are hugely helpful in conveying feeling, but Stik seems to manage without them. Gainsborough shows us a pair of beautiful, young girls, in expensive, highly fashionable clothes and hairstyles, holding objects representing their fame and fortune and sitting in an idealised spring landscape. 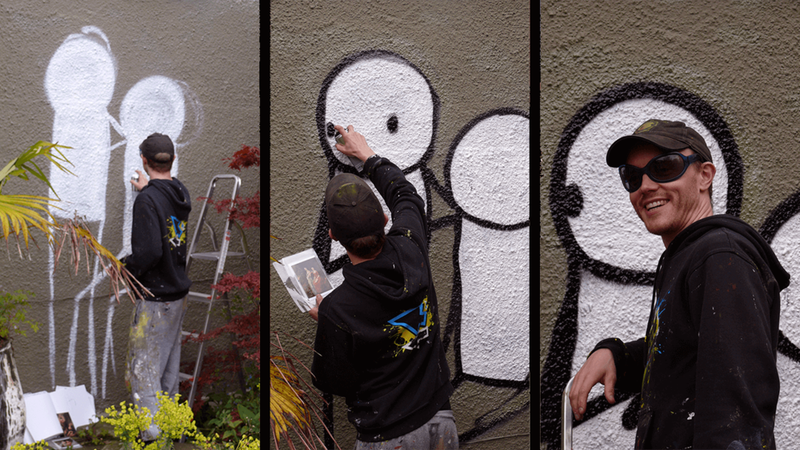 Stik has represented only the relationship between two people. The standing figure leans casually on the other’s shoulder, gazing into the distance. The seated figure engages with us, the viewers. They are comfortable with each other, but in their own separate worlds. It is this, not their youth, beauty, social status or talents, that Stik encapsulates. And it is these enduring qualities that we identify with nearly 250 years later, over and above nuances of wealth and status, so important and apparent when the painting was made. In 2012 Stik interpreted six works of art from Dulwich Picture Gallery on walls in its surrounding area with the help of local art historian and Gallery employee, Ingrid Beazley. 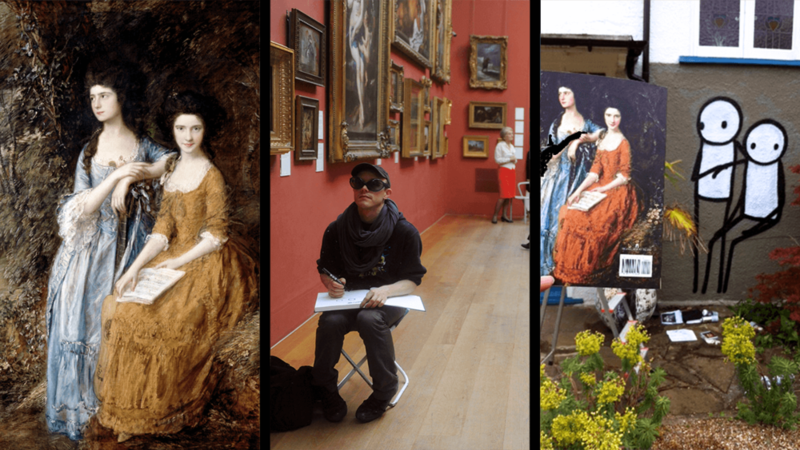 In 2013 and subsequently, Ingrid took this idea further, arranging for over 17 other street artists to make their versions of the Dulwich old masters, and registering the collection as Dulwich Outdoor Gallery. In 2014 she documented this in a book, ‘Street Art Fine Art’, available, in hardback and updated in 2015 in paperback. More on Stik's work, including his Dulwich paintings, can be seen in the hardback catalogue Stik.